Wonder Woman 1984 director Patty Jenkins has released the first image of Pedro Pascal from the upcoming sequel and DC fans are scrambling to figure out who he's playing. The image is taken from a TV screen, much like the first picture that Gal Gadot shared announcing that production had begun. Gadot and Jenkins have been keeping fans up to date on the sequel through social media and even shared a brief clip with lucky attendees at this year's San Diego Comic-Con, which has been an excellent way of marketing and keeping fans in the loop. 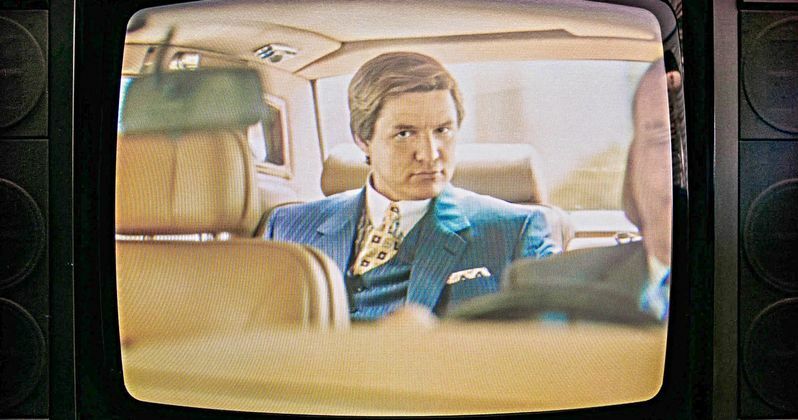 The image of Pedro Pascal in Wonder Woman 1984 shows the actor almost unrecognizable sitting in the back of a car. It appears that he has a driver and he's dressed in a very nice blue suit from 1984. Since Patty Jenkins shared the picture, a lot of DC fans seem to believe that Pascal could be playing Maxwell Lord in the sequel. That obviously has not been confirmed by Jenkins or DC at this time, but the social media comments all seem to be leaning in that direction. Maxwell Lord is a supervillain in DC Comics and has gone up against Wonder Woman and the Justice League in the past. He first appeared in Justice League #1 in May of 1987. The character is depicted as a shrewd businessman. He is a normal human, but gained super powers during the Invasion crossover when a Gene Bomb exploded. The powers gave Lord the ability to control minds, which led to Diana Prince killing him in the Infinite Crisis series after he had taken control of Superman. Prince infamously snapped his neck, which is something that fans are hoping shows up in Wonder Woman 1984, if Pedro Pascal is playing the character. However, even if he is, it seems highly unlikely that Patty Jenkins would take the movie in that direction. Previous Wonder Woman 1984 rumors have placed Pedro Pascal as playing a god in disguise. Fans have placed him as Doctor Fate, but that seems unlikely at this time. In the image that Patty Jenkins shared, Pascal's suit is blue with gold highlights, which has also led fans to speculate that he could be Nabu, the powerful magic-user and prominent member of the Lords of Order, who's colors are also blue and gold. None of the aforementioned fan theories have been confirmed at this time. Even with our first look at Pedro Pascal in Wonder Woman 1984, it's hard to pin down who exactly he will be playing in the highly anticipated sequel. But, he appears to be pulling his weight since Patty Jenkins captioned the photo with, "Can't... stop... watching..." As previously noted, the actor almost looks unrecognizable, which adds another element of mystery about the character as well. Hopefully, a synopsis for Wonder Woman 1984 is released soon. For now, you can take a look at the first image of Pedro Pascal from the sequel below, provided by Patty Jenkins' Twitter account.